A convincing defeat for the French side against Club Brugge. A tough first-half for Thierry Henry. 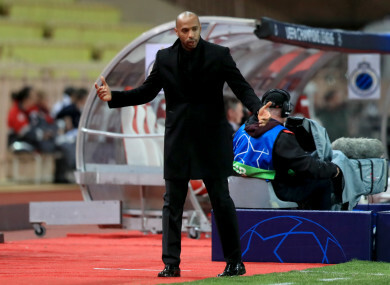 IT’S BEEN A tough start to life as Monaco manager for Thierry Henry since he took over the French club last month and it didn’t improve tonight when they were hammered at home by Club Brugge in the Champions League. The result continues the struggles Henry has endured at the helm and brings his record to three defeats and two draws from five games since taking charge. They made a dreadful opening to this home tie against the Belgium side with Club Brugge racing into a 3-0 lead by the 24th minute. Hans Vanaken netted twice, once from the penalty spot, and Wesley added the third to leave Monaco with a mountain to climb early on. They were still three adrift at the interval and could not pull a goal back in the second half with Club Brugge rounding off their success by adding a fourth goal five minutes from time through Ruud Vormer. The defeat essentially ends their Champions League qualification hopes with just one point from four games to date after a 1-1 draw with Club Brugge a fortnight ago. In domestic action Monaco currently lie 19th in Ligue 1 with just a single win to their credit this season and their poor start to the season had resulted in Henry replacing Leonardo Jardim last month. Email “Thierry Henry's Monaco thrashed 4-0 at home in Champions League as wait for first win continues”. Feedback on “Thierry Henry's Monaco thrashed 4-0 at home in Champions League as wait for first win continues”.